Right ascension: 18h 51m 21s Declination: -6° 15' 42"
The star clouds of Scutum and the other summer constellations are quickly setting shortly after sunset. 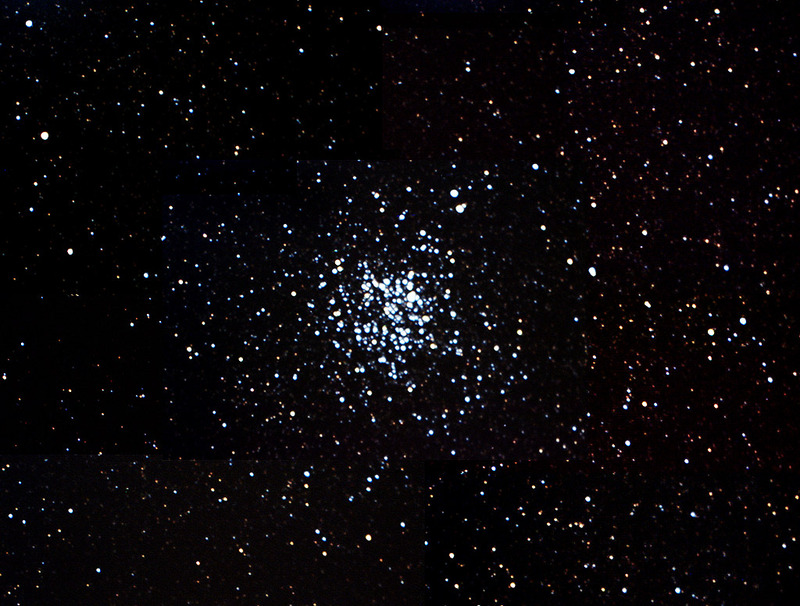 Tonight I was able to image M11, The Wild Duck cluster. This is one of the richest open clusters in the sky. and contains getting on for 3000 stars. I captured 100x10s exposures of the central region and 8x25x10s sets of exposures of the ajoining fields of view. All were captured in k3, debayered in AVIRaw, stacked in registax and curves adjusted in photoshop. Then I used photoshop to layer and adjust the mosaic into one large image. NeatImage was used for minor noise reduction and sharpening. The whole image was then reduced to 1024 wide. Whilst taking this image, I was amazed quite how many stars there are in these regions. I must confess, however hard I look, I see no ducks, wild or otherwise.